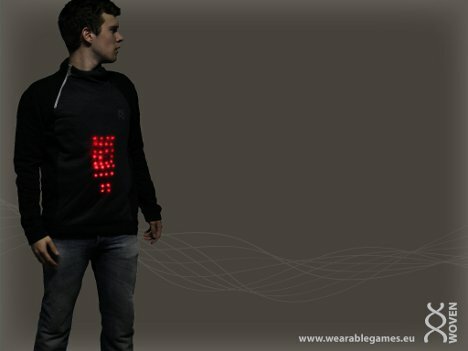 Two Dutch design students, Christiaan Ribbens and Patrick Kersten, have created a wearable gaming platform called Woven that adds a high-tech spin to ordinary daily activities. 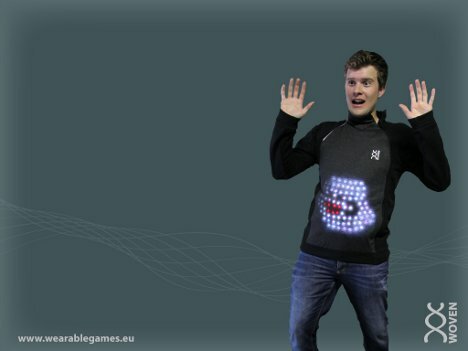 The platform is a sweatshirt that includes an RGB LED screen, speakers, shake motor, bend sensor, heart rate sensor and a bunch of other technology that makes it a wearable, washable, multi-functional controller. Woven is paired with the wearer’s smartphone via Bluetooth and can be used for pervasive games that become a normal part of one’s day. The game specifically designed for this platform, Spooky, has the user being randomly attacked by “ghosts” at different points in the day. Haptic and auditory feedback tell the player what is happening in the game as he uses his whole body to fight the virtual enemies. 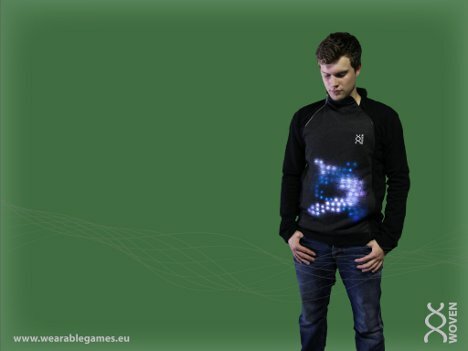 The display on the front of the Woven shirt is not meant to provide visual cues to the player; rather, it gives information to others about what is happening in the player’s game. When there is no game in progress, the display can show a number of fun pictures or logos chosen by the wearer. Besides controlling some very interesting pervasive games, the Woven could be used to control other parts of a technology-filled day. It could be a whole-body controller for other video games or a TV remote control, for example. The designers are just beginning to scratch the surface of the awesome possibilities inherent in a wearable controller. See more in Gaming & Geek or under Gadgets. December, 2012.